This is a comfortable and stylish home. It offers beautiful living spaces. The house benefits from the most beautiful modern dining family kitchen and the style of this compliments many of the traditional features of the property. On the ground floor you have two elegant reception rooms, a quality modern dining kitchen, toilet and utility room. On the first floor there are four beautiful bedrooms which have been restored and the owners have retained many of the original features. On the first floor you will also find a good sized family bathroom. On the second floor you have a large attic space, this has been converted and has had a shower room installed. This floor would make the most perfect master suite. To the front of the property you have views over the neighbouring vegetable plots. To the side of the property you have double gates giving access to a gravelled drive and garage area. To the rear of the property you have a very pretty and easily maintained garden. The garden consists of a newly installed quality decked area, lawn and borders of shrubs. Behind the rear garden you have a good sized established vegetable plot and to the side of this a small barn and some very friendly chickens. The property is located on the edge of a very friendly village and good selection of amenities are with easy walking distance. 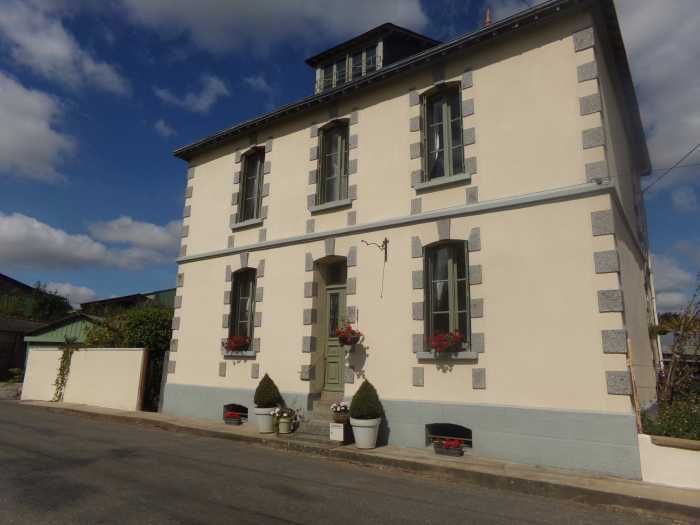 This property makes the perfect family home, but would also lend itself to bed and breakfast accommodation in this very popular area of Brittany.